Yes, you can quickly get a currency rate in Google Search. But beyond you want more information about the currency conversation rates there are plenty of apps are available. We selected the best three apps based on different users need. If you’re a traveler who travels across countries, then, you will need a currency converter app. In this article, we will review the very efficient apps, supports a wide range of different currencies, free to use, intuitive, and compatible with various mobile OS versions. Interestingly, these apps we will review support even Android 4.0. This means you can use any of them on your old Samsung Galaxy Tab 2 (GT-P500). Not only travelers need these apps. Anyone can install them and keep track of the currency rates in different countries to know. Also, these apps won’t just provide the currency rate of different states; they will also let you do more with the help of additional features integrated into them. While there are tons of apps available in different Android app stores, these three are the best and top-rated ones. This application is one of the best compatible apps you can get for this purpose being discussed in today’s article. It is a lightweight application with an intuitive interface anyone could easily comprehend. The All Currency Converter app supports more than 100 different currencies, and its rates are 100% accurate (proven by a lot of reliable sources and users). Some of the currencies supported by this app includes UAE Dirham (AED), Afghan Afghani (AFN), Albanian Lek (ALL), Argentine Peso (ARS), Australian Dollar (AUD), Bangladesh Taka (BDT), Bermuda Dollar (BMD), Brazilian Real (BRL), Bitcoin (BTC), Swiss Franc (CHF), Chinese Yuan (CNY), Ghanaian Cedi (GHS), Gibraltar Pound (GIP), Indian Rupee (INR), Libyan Dinar (LYD), and lots more. Note: the above-listed currencies are not serially arranged. 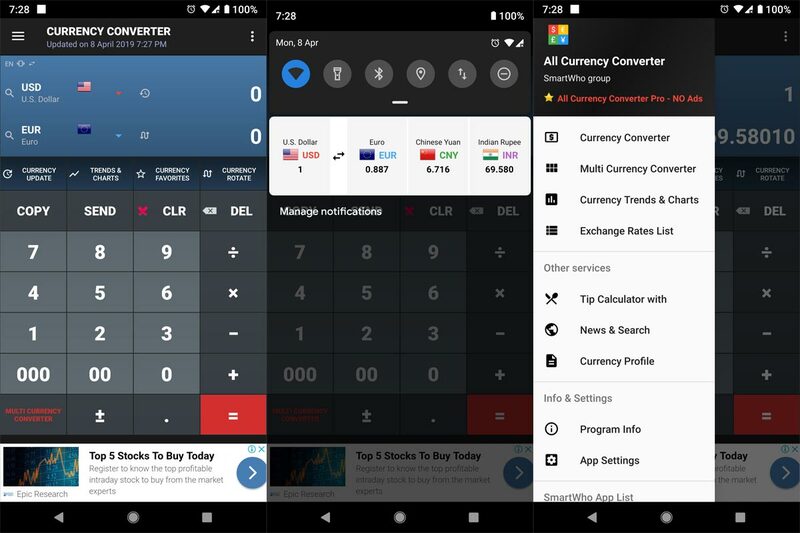 More features of this app include marking of favorite currencies, checking on currency trends and charts, batch currency converter, exchange rates list, news updates on different currencies, and more. Using this app exposes you to entirely other things you need to know about different currencies of different countries. 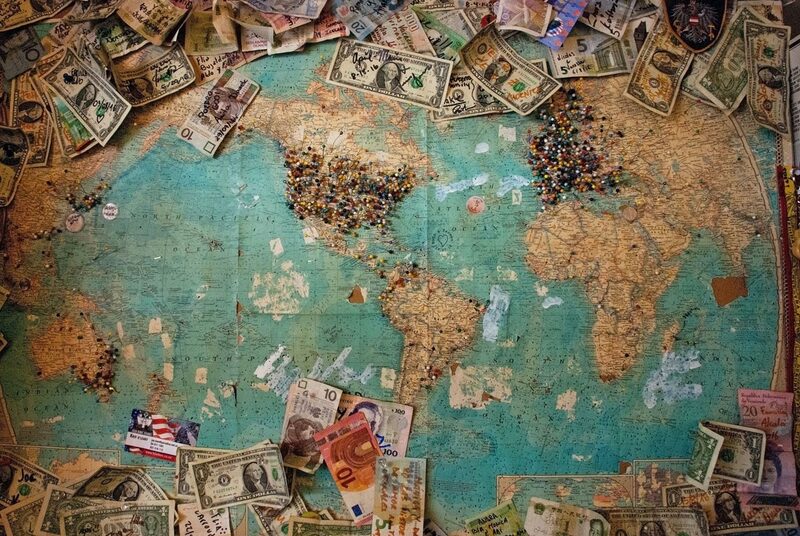 Also, it will help a traveler know everything about the money of any country in the world, thanks to its broad support for various currency types. It is an intuitive app like we said earlier and anyone can easily make use of it. The most exciting thing about this app is that it works on all Android devices, including the ones running on older versions down to gingerbread. Some users complained about lag issues. 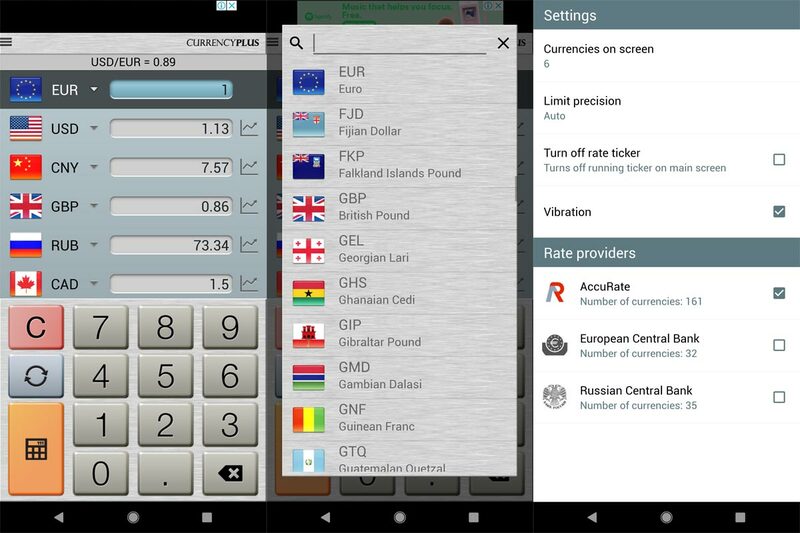 The XE currency converter app is one of the best you can get to use on Android smartphones and tablets. It supports all the world’s currencies and keeps them at your fingerprint for you to toggle and know the conversion rates of different currencies. This article is the favorite of many stakeholders, travelers, as well as ordinary people; its prices are reliable and accurate. Thanks to the intuitive interface featured by the app, everyone can make use of it efficiently. Some features of this app include currency calculator, currency monitor that lets you monitor up to 10 currencies of your choice. Also, the app allows you to monitor markets as it sends instant notifications as regards to XE Rates update. Using this app, you’ll have unlimited free access to know the exact rates of all currencies of the world and equally precious metals. The easy-to-use calculator functions perfectly for calculating currency values. Plus, you can view the history chart of any currency pair in the world. Even, the app sends you daily news on Market Analysis highlighting. Interestingly, you can activate a currency widget on your smartphone’s desktop for quick access. This app is more than a currency converter app. It comes in handy when you’re planning international travel, shopping, or for business transaction purposes. The latest version of this app seems to have bugs Currency rate freeze; A new update can remove it. 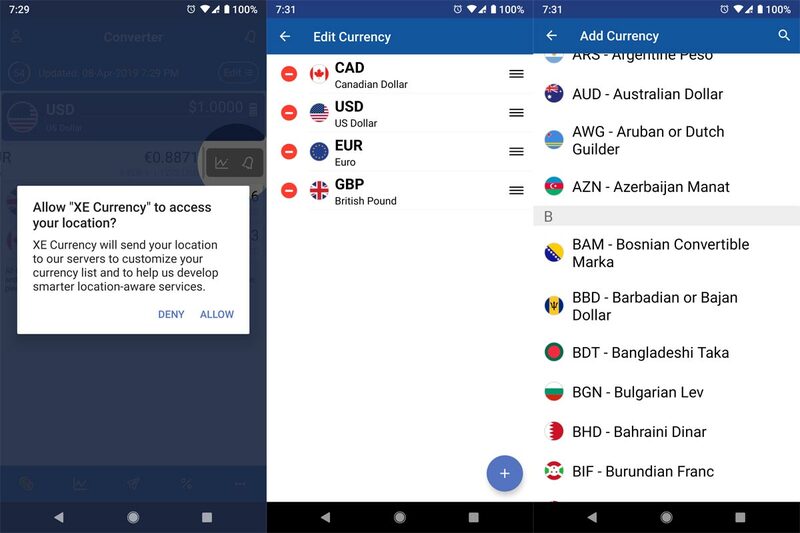 There are different reasons you may need a currency converter app, and this app is just a perfect one for you to choose from. It has a user-friendly interface, and the developer claims it has stocked this app with the most comfortable, most user-friendly stop for global exchange rates, with accurate. There are lots of currencies supported by this app and historical currency rate charts. Plus, this application supports a built-in currency calculator for comparing different currencies which is quite handy when you’re planning on traveling abroad or shopping. Supported currencies include dollar, pound, euro, yuan, yen, won, ruble, franc, dinar, peso, shilling, rupee, rial, dirham, kwacha, florin, krona, guinea, krone, riyal, colon, som, leu, virtual currencies like Bitcoin, plus precious metals like gold, silver, palladium, platinum and lots more. We tested lots of apps based on real-time conversations and usage. As I already mentioned you could get the rates in Google search. But if you want in-depth analysis, you can get these apps. A Small advice, never download third-party apps, other than Play Store, Especially Finance apps. These are the overall currency converter apps for Android mobile users. They are all free apps and come with an intuitive interface which makes it possible for anyone to be able to make use of the app efficiently. You may need a currency converter app for many reasons; these should be the ones you should consider first. If you have better app suggestion comment below, We will Include them after we test.